It’s interesting to see another example of Christian and Islamic cultures exchanging and influencing one another; just as Christianity incorporated the Muslim model of a university into their educational system, the Muslims incorporated Byzantine Orthodox Church architecture with their own. This goes to show that no culture or religious tradition comes about in total isolation from another. It is hard to tell how devout emperors and monarchs (and you can also include religious leaders like popes and patriarchs) really were in their religious convictions. It seems like they had no choice under certain circumstances but to resort to violence or other extreme measures to hold onto power, whether it be for their own good or the good of the entire empire they were looking after. Religion can be used as a powerful tool to motivate, rally, transform, and even divide citizens within a society – and shrewd leaders will know this, build upon that and use people’s beliefs for their own political advantage if they have to. 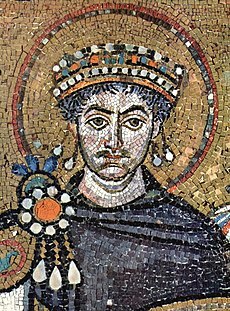 It seems like politics, power, and religion all go hand in hand as we have seen far too often in history, for both good and ill. Emperor Justinian’s life is no different here – through his actions he was able to solidify his reign with Hagia Sophia and secure a distinct Byzantine tradition, culture, and theology that was distinct from the West that still prevail to this day. This idea of Theosis intrigues and draws me in. I would like to step outside its bounds in Eastern Orthodox thought and take it in a different but related direction. Specifically, I am inquiring about the part of Theosis which deals with the ‘substance’ (what we are ‘made of’) of our post-resurrection body. Now our body is physical ‘flesh and blood’ (in substance). What will be the spiritual ‘flesh and blood’ of our new resurrected body? Theosis is often defined as ‘deification’ or ‘union with the Divine’. (MacCulloch p.433) This idea has invigorated my thoughts about OUR resurrection. Paul says: “We see through a glass darkly but then we shall see Him (God) as He is.” Will we be (‘made of’) the same substance (Energia? Immanence? ), even essence (ousia), as God? In our ultimate change (resurrected form) is it not possible, even plausible, that we will share the same substance as God? Or, as some say, that God transcends Being and as created beings we can never attain the same? It seems that God is seeking to ‘expand’ (i.e. ‘reproduce’) His own Family. In a crude analogy, as the caterpillar, who cannot fly, morphs into the butterfly, who can fly, will we ‘morph’ from human flesh into God Spirit substance wise? Can we make a further analogy of this life being a ‘conception and gestation’ period prior to actual ‘birth’ (resurrection) as ‘God’ beings (in substance)? Further, it seems that all Christians share in, and the Bible seems to point to, this idea of ‘union with the Divine’. What is this in its ultimate post-resurrection form? Theosis raises very interesting thoughts about what it is to be fully with Christ and in the God Family (Kingdom of God). Church Fathers as diverse as Clement of Alexandria and Augustine have spoken of “…how man may become God.” (Clement) If defined and used correctly it could offer valuable insights into the Nature of God. My question: Is this just another scheme for salvation by works, a plan as old as man himself? It seems to say that we (mankind) can redeem ourselves. Does this eliminate the need for Christ’s sacrifice, making it redundant? This explanation is extremely dangerous and qualifies as true heresy. I have great difficulty with this definition much as the concept of Penance in the previous chapters. To be fair, I admit my unfamiliarity with their understanding. Seems we need to discuss what is meant by the phrase “…through the liturgy…and…labor” more thoroughly. The Eastern theology of theosis or ‘deification’ – union with the divine: Do you think it’s heretical? Unbiblical? Or something Western Christians can learn from or should incorporate into their spiritual practice? Deification, on first hearing it to my Western ears it does sound alarming. It reminds us of the arrogance of Adam where he decided to become equal to God, to be our own God. Idolatry is to hold something in place of God. What the Eastern thought is more of is a union with God- to be with God and be more like God. Ultimately isn’t that a Christian’s goal? Sin separated us from God and Christ’s blood enabled us to be with God once more. We study to learn more of God’s nature and try to do good as God would do, replacing our human nature with a godly one. We are not to be absorbed by God into a sort of collective, but should retain our own identity that is closely entwined with God. Such as lovers who annoyingly finish each other’s sentences. Christ was the best example of a how a human nature to a Godly nature with Maximus’s example of the passion in the Garden of Gethsemane. Jesus did not want to be crucified, as a man he used this human will to obey his divine will.